This is the 21st in a 60-part series featuring 60 major events in Korea's modern history from 1884 till now. The project is part of the 60th anniversary of The Korea Times, which falls on Nov. 1. 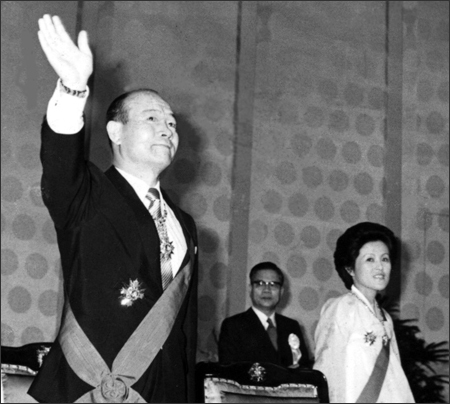 After the murder of Korean president, Park Chung-hee, in late 1979 by his own intelligence chief, the reins of government were taken up by then prime minister Choi Kyuh-hah. Chun Doo-hwan, the army general who would eventually take power, was heading the Defense Security Command, the military intelligence agency investigating Park's assassination. Chun's investigators in particular wanted to know if there had been a broader conspiracy. There were unanswered questions about the possible involvement of Chung Seung-hwa, the martial law commander who now held the real power in the country. Chun also had a more personal reason to wonder about Chung. The military intelligence chief was the leader of the officers of the 11th class of the Korean Military Academy which graduated in 1955. Older officers had either trained under the Japanese or attended the academy for brief training before it instituted its full four-year course. Chun's class members were considered the first real fully Korean-trained officers and commanded strong loyalty from officers of later graduating classes. When they received intelligence that martial law commander Chung planned to remove Chun from his powerful post and reassign him to a field command, they rebelled. On the night of December 12, 1979, Chun arrested the martial law commander. When loyal troops came to Chung's aid, a gun battle broke out and some soldiers were killed. One of Chun's backers, General Roh Tae-woo, ordered troops under his command down from the DMZ to Seoul, leaving a gap in the defenses against North Korea. After this act of mutiny, there was no turning back. The younger officers prevailed and Chun emerged in control of the military. This event - "12.12" as it is known - marked the first step in what is usually referred to as Chun's coup, but which was in fact a phased assumption of power. Like Park Chung-hee before him, Chun Doo-hwan came from a poor family. He was the seventh of ten children. He was captain of the football team in the military academy and was nicknamed Lieutenant Principle for his alleged uprightness. He once assaulted two soldiers who tried to bribe him with cigarettes. He went on to marry Lee Soon-ja, who was the daughter of the chief of staff at the military academy. In 1959 Chun went to the United States where he studied psychological warfare and went through ranger training. From 1970-71, Chun commanded a regiment of the 9th (White Horse) Division, and served in Vietnam, where he thought that internal conflict was the source of South Vietnam's weakness. He wrote in a letter to Park that South Korea needed a "Koreanized democracy" to avoid the same fate. Chun eventually became a general and commanded the First Airborne Special Force. He was later the assistant to the presidential security chief. In 1978, he was appointed the commander of the First Division, overseeing the construction of a strategic defense wall near the DMZ and the discovery of the third North Korean invasion tunnel under it. In March 1979, he was assigned to command the Defense Security Command, the intelligence agency that polices the military. The day after the "12.12" incident, all seemed calm. Acting-President Choi appeared to be in charge and people were basking in the post-Park freedom. In February, the civil rights of opposition leader Kim Dae-jung and around 700 dissidents banned by Park were restored. In March, students went back to school where they formed associations and took to the streets. Workers staged strikes to press their demands. In parliament, politicians argued and held up the rewriting of the constitution. The economy was reeling under the effects of a global recession. Gradually the President did not really appear to be in charge at all. This period may have looked scruffy, but it was an outburst of democratic disputes after decades of repression. It came to be known as the "Seoul Spring." But to military officers like Chun, it was alarming evidence of the disease of internal conflict that threatened to weaken the country's ability to withstand the nationalistic lure and military threat of North Korea. In April, Chun took another bold step, appointing himself head of the KCIA. In May, student protests against martial law gathered momentum. Finally, on May 16, the ruling party leader, Kim Jong-pil, himself a key figure in Park's 1961 coup, joined in the call for an end to martial law. But it was too late. On May 17, 1980, Chun informed the cabinet he was taking over. Political activity was banned, leading politicians were arrested, media censored and universities closed. Troops were deployed to do police work. They arrested activists and went onto campuses to prevent students from gathering. In what later turned out to have been a tragic misjudgment, highly trained special forces were assigned to quell protests by students of Chonnam and Chosun universities in Gwangju. They undertook their mission with shocking brutality. Soldiers beat and bayoneted demonstrators. They barged into coffee shops and stormed onto buses, savagely beating young people of student age. Troops used flamethrowers on protesters. The hospitals began filling up with dead and injured. Far from cowering, the citizenry erupted in rebellion. In a move that should go down in the annals of people power, Gwangju taxi drivers executed a strategic maneuver with their vehicles that forced the elite troops to retreat. The city was retaken a few days later by paratroopers. The final death toll for the nine-day event was over two hundred. The ghosts of Gwangju haunted the corridors of power throughout the 1980s. They are the main reason that Chun Doo-hwan, despite his effective leadership, continuation of economic growth, and transition to democracy, was never seen as having the mandate of heaven and why his rule, unlike that of Park Chung-hee, is almost universally seen by Koreans as an unwanted interruption in their modern history.